North East Soiree Quartet specialises in providing live music for Corporate Functions and can also supply a PA system and a number of Radio mics if required. The String Quartet can provide unique and memorable entertainment for Annual Balls, Charity Fundraisers, Conference Entertainment, Networking Events, Product Launches and Christmas Parties. The String Quartet often perform in Northumberland, Newcastle-upon-Tyne, Durham, Teesside and North Yorkshire. One unique feature is that the Quartet can start performing during the welcoming drinks reception and then swap instruments to form a Jazz band ideal for a large formal dinner. North East Soiree String Quartet is a group based in the North East that is flexible and professional in its approach to make your event a success. There are a variety of packages available for corporate functions and music can be tailor made to meet your requirements including Jazz, Popular, Folk, Film and Classical Music. The musicians in the String Quartet can also play in other ensembles to provide varied styles at events. 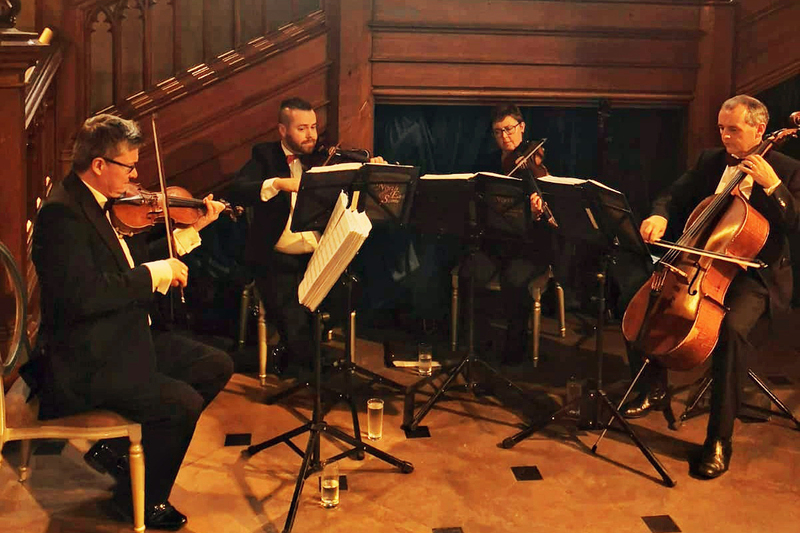 North East Soiree String Quartet has experience in working with a variety of different organisations, having worked with professional PR companies, public sector organisations, private companies and charities to provide a tailored, individual service. Contact Gordon for more information on corporate events on 07768 323 832. North East Soiree String Quartet can provide a special and sophisticated atmosphere to a restaurant. For example, we can provide musicians for Valentine Dinners, Mother's Day Lunches, Sunday Lunches, New Year's Day Celebrations and other special events and with some warning can arrange music for a particular themed event. Please contact Gordon for further details on 01388 327 202 or Mobile 07768 323 832. A String Quartet is perfect for a party celebration. The quartet can play different styles of music from classical to arrangements of jazz standards and chart music. If there is a theme to the event we can play suitable music.